Daughters of the Witching Hill brings history to life in a vivid and wrenching account of a family sustained by love as they try to survive the hysteria of a witch-hunt. Bess Southerns, an impoverished widow living in Pendle Forest, is haunted by visions and gains a reputation as a cunning woman. Drawing on the Catholic folk magic of her youth, Bess heals the sick and foretells the future. As she ages, she instructs her granddaughter, Alizon, in her craft, as well as her best friend, who ultimately turns to dark magic. When a peddler suffers a stroke after exchanging harsh words with Alizon, a local magistrate, eager to make his name as a witch finder, plays neighbors and family members against one another until suspicion and paranoia reach frenzied heights. Sharratt interweaves well-researched historical details of the 1612 Pendle witch-hunt with a beautifully imagined story of strong women, family, and betrayal. 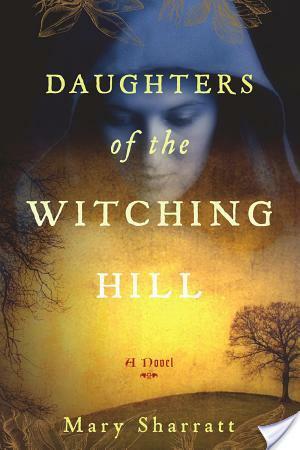 Daughters of the Witching Hill is a powerful novel of intrigue and revelation. This e-book includes a sample chapter of ILLUMINATIONS. So you know how Salem had a bunch of trials for witches in the 1600s? Well, Daughters of Witching Hill by Mary Sharratt has nothing to do with Salem. It takes place in England, in this place called Pendle Forest. The story is first told in first person through the eyes of Bess Southerns, this old woman who is super poor, like she begs for money and eats bark. Anyways, she gets visited by this familiar and finds out she can do magic and bless things. And whoo-hoo she begins to eat better food, such as oats. Eventually, her granddaughter, Alizon Device takes over narration. Daughters of Witching Hill was definitely not a warm fuzzy story. The characters are impoverished. They eat gross food. They live in the time when England is transitioning from Catholicism to Anglicanism, so there’s this frenzy in getting rid of anything that could even so much as hint at the old ways. Instead of church being fun and full of cool things like saints and rosaries, it becomes dour. With the rise of King James I, comes a rise in witch-hunting, as James writes this book on how to catch witches, and well apparently in real life they had 500 witch executions at this time, according to Wikipedia. Yeah so, while Bess Southerns aka Old Demdike is going around doing good things for people like curing them of diseases, her BFF is going around cursing people, and giving witches a bad name. Eventually, all hell breaks loose, and the book takes a sad turn of events. As for the characters, like I stated, Daughters Of The Witching Hill by Mary Sharratt is told in first person, and while I think first person is a great plot device and a wonderful way to get to know a character, I do think we lose a little something when there isn’t a third person narrator, as well only know the true motivations of the narrating character. I enjoyed reading from the perspective of Bess and from Alizon, although there were times when I wanted to shake both characters, regardless of them being products of their times. I found it interesting how quickly suspicion was thrown on women who were unmarried. It felt like if a woman didn’t have a man to keep her in line, then obviously she is a witch. If a woman holds to the Roman Catholic religion, clearly, she’s consorting with the devil. I hated how much power certain characters had over the fates of Bess, Alizon, and their families. I thought Sharratt did a great job of building a creepy atmosphere in Daughters Of The Witching Hill. I was so drawn into the tale of Pendle Forest. I guess I’m still picturing woods and fog and hovels. Also, am picturing that scene from Monty Python and the Holy Grail, where the woman is all “I’m not a witch! You dressed me this way.” And the villager is all, “she turned me into a newt.” Yes, I understand that is a little inappropriate for how serious this book was, but you’ll need a laugh after finishing this one. It was fantastic, but yes, you’ll need something to lighten the mood after. Wow, this sounds very intense. I did not know King James had written a book on catching witches (in addition to editing the Bible, was it? Or different James?) This sounds like something I'd like- but not ready for a dark read yet! This book looks fantastic. I've recently become fascinated with early ideas of witchcraft (sadly, the Sarah Jessica Parker episode of Who Do You Think You Are? prompted this new fascination), and this book might be the perfect remedy. Those crazy unmarried women…witches all of them! Wow this does sound good! Nice review! I like books that go into the darkness of old times and give us the opportunity to see what it was really like. I'd never heard of this before, but it kind of sounds wonderful. This sounds like it's well worth the 'heaviness'. My mother used to tell me about Demdike when I was little, but I'm pretty sure this will be a *lot* darker than her version. Fascinating stuff, thanks for reviewing it. I love this historical period, and this sounds like something I'd love. So thank you for bringing it to my attention. Also, it's only human to need a laugh 😛 I love that MP scene. Ooh a dark read. I love dark novels so I might want to pick this up. This sounds really intense and something like The Crucible. Amazing review!